Make a bold statement with your very own Personalized Message T-shirt. A fun, novelty gift that is great for your Dad, Grandpa or Uncle on Father's Day. Create fun statements for all of your friends to proudly wear at a birthday party. Our Personalized T-Shirts are available on our premium white 100% cotton Personalized Shirt, machine washable in adult sizes S-3XL. Includes FREE Personalization! 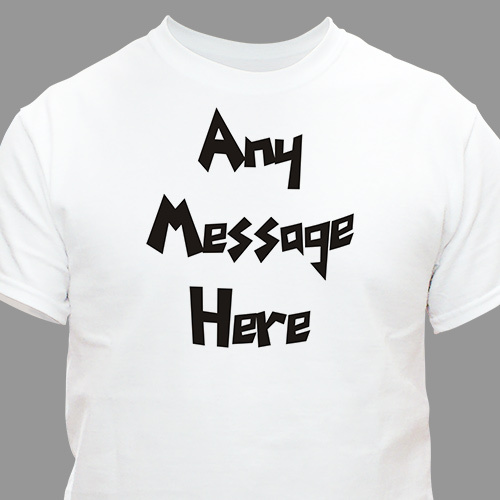 Personalize your Any Message Here T-Shirt with any three line message in our Funky font, choose between 10 different colors for the text. I like how you have the ability to customize your shirt to what you want. You choose the color of the letters to the type of lettering. This T-shirt came out awesome.